Only one day after Angela Merkel realised that she was faced with a divided nation and an even further divide in the political landscape after coalition talks broke down on Sunday night, 500 German Police have swooped in on flat raids of Syrian migrants and refugees in Kassel, Hannover, Essen and Leipzig, who were plotting a coordinated terrorist attack on a Christmas Market in the town of Essen. 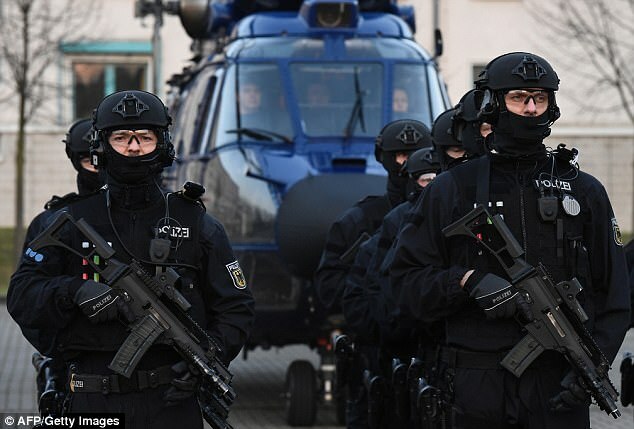 The German Police are already on high alert after the attack on Berlin last year on December 12th. The six Syrians were planning to use explosives and weapons to unleash the ISIS attack on innocent German civilians yet again. The suspects who were arrested, are between the ages of 20 to 28 years old, arrived as asylum seekers between December 2014 and September 2015. There’s that “cultural enrichment” and “all refugees welcome” policy rearing its ugly head again. The names of the arrested terrorists is being withheld under strict German privacy laws, but lets hope that under this German socialist rule, they’re promptly dealt with via a life imprisonment instead of getting a slap on the wrist or a short term prison sentence, then released and given benefits for life as well as socialist liberal sympathy does… As is usually the case with socialist nations such as Germany and Sweden. The six Syrians are accused of “having prepared an attack with weapons and explosives on a public target in Germany”. Prosecutors are refusing to give further details, citing the ongoing investigation, but have said the men had thankfully not finished preparing for the attack. Well, obviously not, otherwise it would have happened already, right? Germany remains on high alert after much bloodshed in 2016. We can mainly pin that down to Angela Merkel and her disastrous policies on refugees and migration, covered up with those socialist censorship schemes adopted by the mass media, and coupled with political correctness. Tensions are now growing and reaching a breaking point in Germany. Are we surprised? No, we are not. Luckily, this time the German Police were able to foil this attack. Hopefully we may see a harder line in dealing with terrorist refugees, known ISIS fighters that live on our streets, and even maybe even going as far as to deliver capital punishment for such offenders. Plus, immediate deportations for terror linked illegal migrants and sympathisers should also be considered, for the sake of Europe, and not for the sake of political correctness, which as we all know is another socialist construct that causes damage in of itself. Let’s hope that the new predicted snap elections in Germany can help to revert the damage done, which has been caused by Angela Merkel’s disastrous reign as German Chancellor. Wouldn’t that be something?